Mini Coconut Chocolate Chip Cookies. Chewy cookies without butter? …. you don’t say. I was scared. Or better yet: scuuuuurrrred. But then I sampled quite a bit of dough. And my fears suddenly subsided. Weird. What is it about coconut that makes it so… springy? Springy as in like, the season. Not as in an actual spring. You know. Is it an Easter thing? Mother Lovett always made a coconut cake or an orange coconut cake around this time too. It must just be a life thing. Like one of those really important pieces of information that your mind collects along the way. Either way, I don’t really care. I flip for coconut. I had no idea if the whole I’m-out-of-butter-but-let’s-put-coconut-oil-in-cookies idea would turn out. The thought had rolled around in my brain for quite some time, but… it seemed a tad too good to be true. But I love when I’m wrong. Sort of? These cookies came out lovely – soft and chewy, a hint of coconut, a bite of melty chocolate… and the perfect size for snack popping. I don’t discriminate when it comes to cookies – sometimes I crave thin and crispy while other times it’s soft and chewy. These = soft and chewy. Plus, they’re obviously mini. That’s another life thing: mini things don’t count calorically. Luckily I gathered this knowledge long ago. In a large bowl, whisk together melted coconut oil and sugars. Let sit for 15 minutes. Whisk in egg, egg yolk and extracts, mixing until completely smooth. If any brown sugar chunks remain, I simply pounded them with my whisk and kept stirring! Add in 1/2 cup flour, baking soda and soda, stirring to combine. Add remaining flour 1/2 cup at a time, stirring to bring it together. It may seem crumbly, but continue to stir and even use your hands. It will come together. Finally, fold in coconut and chocolate chips. Take 1 to 1 1/2 tablespoons of dough and roll it into a ball, placing it on a nonstick baking sheet. Place dough about 1-2 inches away from each other. Bake for 7-8 minutes, or until just set. Let cool completely. Note: you can leave out the coconut extract if desired. You can also make these as normal sized cookies. 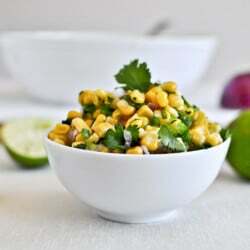 Just Like Chipotle’s Corn Salsa. I’m making them now! I love coconut! Thank you!! Just made these and your warm bean and spinach salad. Both were delicious! Thank you!! Made these tonight and YUM love them!! Thanks for the recipe!! These are amazing! Have made them twice now. They completely disappeared when I took them to my parent’s for mother’s day. I skip the 1/3 cup of white sugar and use only 1 cup of turbinado sugar and then use white whole wheat pastry flour. Want to try to make these into an oatmeal raisin coconut version. Yummy! Have you tried using Whole Wheat pastry flour? Also, do you add in one 3/4 cup of coconut oil in liquid form. I just don’t know whether to use 3/4 solidified coconut oil and afterwards wait for it to melt when I’m working it into the dough. I made these just now, actually the 2nd sheet is in the oven right now. I made them a bit too small, like more than 50, also they stayed round and plump. A bit crunchy on top, soft and chewy inside. Delicate coconut flavour mixed with a dash of chocolate. Didn’t find any coconut extract, but these still came out perfect. Just made these today and they were delicious! Perfection, in fact! Omg these look amazing!! I have been drooling at coconut recipes from this site so much, I finally had to go out and spend $50 on spreaded coconut, coconut milk, coconut oil, and condensed milk. The coconut bakesplosion in my kitchen cannot be contained. Found your site via Google search, made the cookies, and they were delicious. Thanks for sharing. I love these. Love! I didn’t have chocolate chips, so I made them with a ton of chopped up coconut mn’ms. They were DELICIOUS. Oh. My. Goodness. I just made these and they are SO, SO good. Absolute perfection! And to think it all happened without butter! I made these. They were fantastic and now I will never worry about not having butter again! YUMMY!! Did not have any coconut shreds, but otherwise followed recipe to a tee. Had to keep chasing BF out of kitchen and away from the dough. Sooo good!! I have a problem with using coconut oil…my cookies don’t rise…they are flatter than pancakes! yummy but flat! Can anyone help me out here?!?!? I bake all the time and with cookies I always use organic butter but all I had on hand was coconut oil. Found this recipe and was skeptical at first bc I LOVE my butter but I was blown away by these cookies! The texture was perfect and my husband and mother in law said they were the best cookies they’ve ever had! I plan on using coconut oil in my chocolate chip cookies from now on! My new go to recipe! that you could do without. Vitamin E is the compound found in (virgin) coconut oil. The most natural moisturizing ingredient out there is plain water. These cookies are delicious. However, I rolled them into balls as you stated, but they did not spread out at all when baked. They remained in round balls. They took about three more minutes to bake than stated in the recipe. Was I supposed to flatten them before baking? I will definitely make these again. Hi!, I can’t to use coconut oil, Anyone knows if I can use other kind of oil. Thanks. Just made these tonight. I added way too much chocolate chips but I always do when I make homemade cookies. They did not want to stay together. I may have measured the coconut oil improperly. I scooped it into a glass measuring cup then nuked it till it melted then poured off until it measured 3/4 cup. The cookies still came out great. Super chewy, but a little oily. I used regular sized chocolate chips. BTW, most cookies I make are measured with a 1 tablespoon scoop and I consider them average size not mini. I hope these freeze well because I made them 3 wks ahead and are in the freezer now. I was hoping to make these for some of my friends who are vegan. Do you know if there’s anyway to replace the egg with something else?